Thank you for visiting my online studio. I create art in a variety of mediums. 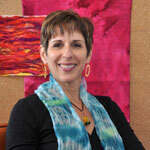 Currently I enjoy making fused glass, fiber art and jewelry. Take a look at my gallery pages to see what I've been doing. For pricing and sales information, please fill out this form, and I will contact you soon. Growing up in a home surrounded by art gave me an appreciation for all types of art. I loved art class as a child but didn't pursue it further. Years later I found that I enjoyed taking classes in mosaics, knitting, jewelry fabrication, stained glass, fused glass and more. I am fortunate to have had a number of teachers, mentors and artistic guides who have taught me skills and techniques and encouraged me to explore my creative interests. I am drawn to colors, shapes, textures and forms found in nature, architecture, design, and the world around me. I notice a repetition of these elements across the different mediums in which I work. Patterns seem to emerge without conscious thought and I gain satisfaction from creating something with my own hands. Being in my studio frees me from the cares of the world and provides the opportunity to balance spontaneous creativity with quality craftsmanship. As a child I used to ask my mother, "What can I do today that I've never done before?" referring to what new arts and craft project I could try. This curiosity to explore new and different techniques, styles and mediums is still with me today. Who knows where this might lead in my creative journey. © Copyright 2011 Sona Nast. All rights reserved.